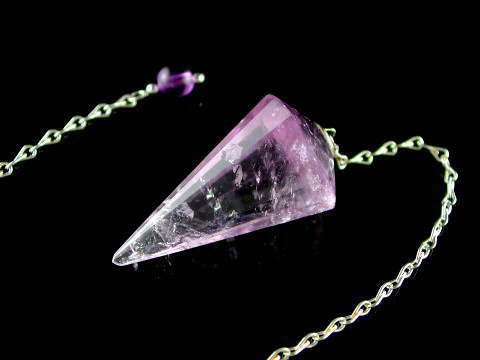 Lovely quality, soft violet colour, Amethyst 12-sided generator pendulum, with beautiful inclusions and finished with a 6mm Amethyst bead on a white metal chain. Another firm favourite from the Quartz family! Amethyst enhances the function of the Brow or Third Eye Chakra; protective and powerful with a high vibration. It has been used throughout the ages for its protective properties; to protect from fear, guard against bad dreams, to absorb and dispel negativity, and is favoured by healers for its ability to focus energy. Amethyst is one of the best stones for awakening and/or enhancing psychic or intuitive abilities. It aids our connection with our higher self, whilst providing protection from negative energies and unwanted enterties.